KADENA AIR BASE, Okinawa, Japan — The OKISLAM Volleyball Club on Kadena is using the common bond of sports to bring people together and improve the relationship between Americans and Okinawans. The founder and manager of OKISLAM, Art Arao, says using volleyball for international relations is a fun way to bring all types of people together. “Our club has Americans and Okinawans from all walks of life: dependents, active duty servicemembers, school kids and all different types of people,” Arao said. OKISLAM currently has 27 members, but Arao would like to see it grow as he has some big goals for the club. 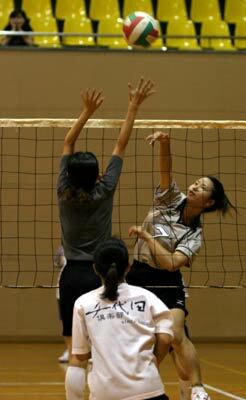 Nine-man volleyball is a common format for most tournaments on Okinawa. Besides playing with three extra people, some of the rule differences include playing on an expanded court for men, while women still play on a regular six-person dimension court. 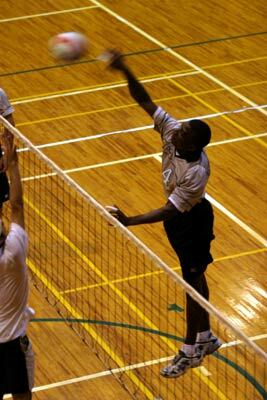 Teams are allowed four hits versus three and two serves instead of one. Additionally, there is no rotation of players out of their set positions. The OKISLAM club plays in seven to eight tournaments each year along with numerous scrimmages and mini-tournaments. With so many opportunities to interact with locals, Arao keeps his focus on the international relations being built and tries to clear up misinterpretations and stereotypes. According to OKISLAM player Fidel Folkes, the club is not only a great way to show a positive side of the U.S. military, it is also a great way to improve linguistic skills. Folkes first played for OKISLAM from 2000-2002 and started playing again upon his return to Okinawa in November 2003. OKISLAM holds practices every Wednesday night from 8 to 10 p.m. at the Yamauchi Elementary School gymnasium and is open to anyone. However, Arao said if anyone is interested, they need to have the right attitude to join.